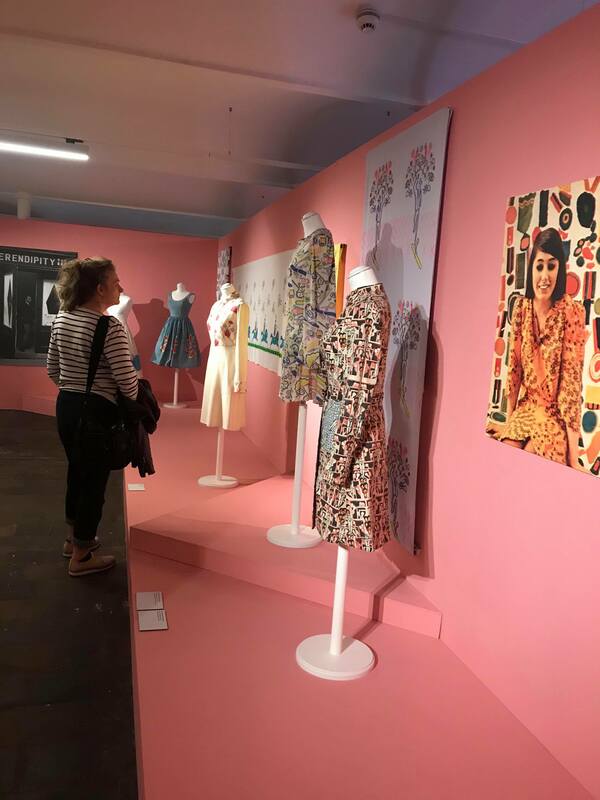 ‘Artist Textiles’ was first exhibited at the Fashion and Textile Museum in 2014 and is currently on show at the New Lanark Visitor Centre. The exhibition displays over two hundred objects ranging from dresses to trade books from across the twentieth century. Highlights include textile designs from Salvador Dalí, Andy Warhol, Sonia Delaunay, Henri Matisse, Pablo Picasso and Fernand Léger. The exhibition is spread across the floor of one of the main mill buildings with a mixture of objects in glass display cases, mounted textiles and mannequins on plinths. There is steady chronological flow, following the growth of mass produced textiles from the 1910s to the 1970s. Designs throughout the exhibition appear fresh and contemporary and would not look out of place within the high street today. Print subjects vary from the circus to candy apples and the objects exhibited showcase a variety of printing techniques, including screen printing, roller printing and block printing. 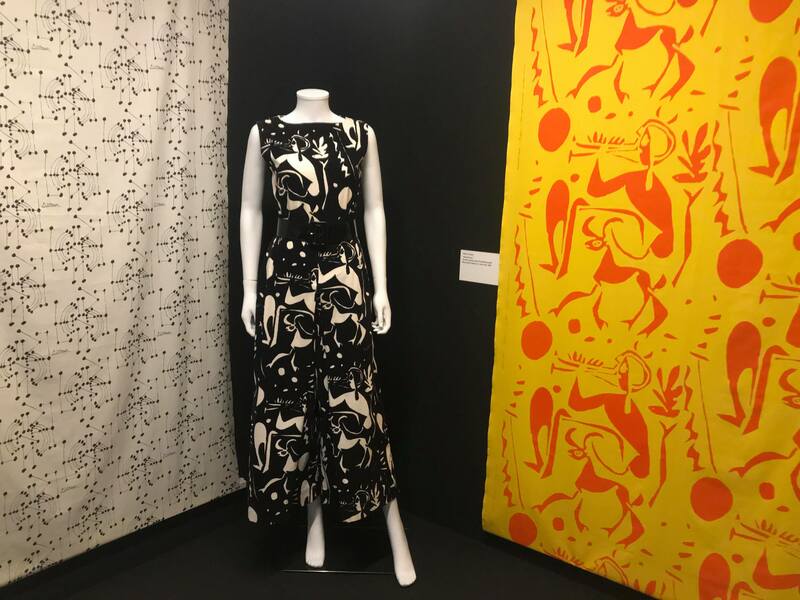 There are a number of long lengths of screen printed textiles mounted, ready to be run up on the sewing machine into border-printed circle skirts, including an Andy Warhol acrobatic clown border design. Throughout the exhibition art movements, such as Modernism and Pop Art, are celebrated and textile techniques, such as screen printing and weaving, are given the spotlight. The exhibition itself is static and although this does not affect the overall experience there was perhaps a missed opportunity for some interactive stations to encourage viewers to get creative themselves. Each room of the exhibition is colour blocked to effectively showcase the designs on display. The only section that perhaps did not feel as strong was the Picasso display which was set against black. The black backdrop allows some of the objects displayed to stand out but feels disjointed from the technicolour walls before. 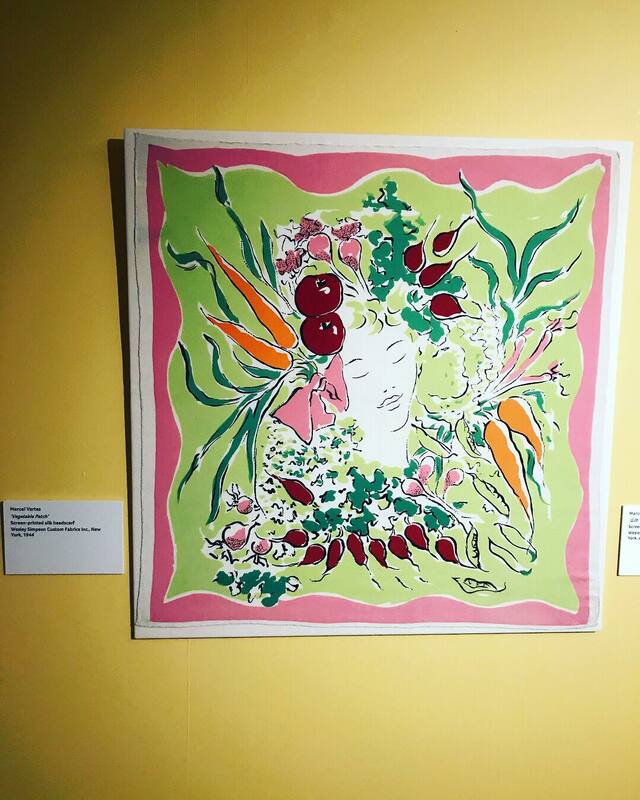 A personal highlight for me was the ‘Surreal Things’ section of the exhibition featuring Marcel Vertès’ trademark novelty prints, including the below ‘Vegetable Patch’ pattern which left me with serious head scarf envy. Vertès’ work also translated beautifully across into garments designed by the American designer Claire McCardell. Some garments are on open display which invites you to get up close and appreciate the intricacies of the prints. This was incredibly engaging and it was a treat to see viewers carefully peering over the elevated plinths to see the design details on the backs of the garments. Amongst the mannequins and mounted fabrics there are a scattering of advertisements from various publications such as ‘Look’ and these bring contemporary context to the designs. For the sum of $30 you could be the proud owner of a Picasso designed corduroy ‘Hostess Cocktail Culotte’ in 1963. Although in today’s monetary value the garment would be mid-end price range, it did convey the growing accessibility and appreciation of artistic wares within the discerning consumer’s home and wardrobe. Whilst walking through the exhibition I imagined the original wearers of some of the garments and their relationships to their wearable art. I left the exhibition creatively recharged with an itch to get back to my sewing machine. I found the exhibition accessible to all ages and interests and would definitely recommend a day trip out to New Lanark Heritage Site to enjoy both the exhibition and beautiful surroundings. 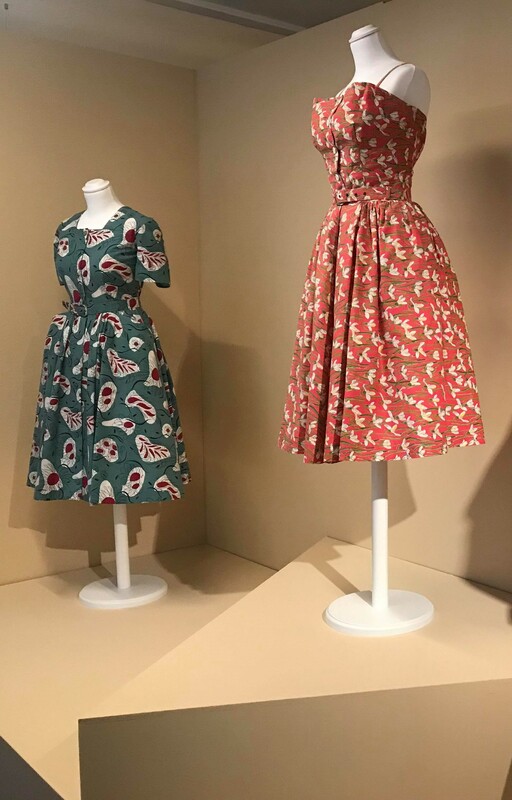 The exhibition is in partnership with the Fashion and Textile Museum, London and will be open until 29th April 2018. For more information please visit http://www.newlanark.org/visitorcentre/artist-textiles.shtml. Rayner, Geoffrey, Richard Chamberlain, and Annamarie Stapleton. Artists Textiles: Artist Designed Textiles 1940-1976. Woodbridge: Antique Collectors Club, 2014.